A few easy lifestyle adjustments in the lead up to allergy season can help to reduce symptoms relating to allergic eyes. 1. Vacuum regularly. Run over your carpets often and dust around your home (dampen the worst areas). 2. Keep your bedding clean. Change your sheets and pillowcases regularly. 3. Close your windows. This will help keep the allergens out. 4. Cut down on alcohol. Beer, wine and spirits all contain histamines, which only adds to your misery. 5. Get a good night’s sleep. When your body is under attack, it needs all the recovery time you can get. 6. Reduce stress. Experts say that stress will increase the severity of your springtime woes. 7. Plan your day. Try not to go out in peak allergen time (tree pollen is at its worse in the morning). If you exercise outside, leave it until the late afternoon or evening. 8. Keep the eye drops handy. A visit to your local chemist will calm your symptoms. Even better, if you’re proactive you can avoid allergic, itchy eyes altogether. The key to a symptom-free spring. Following these easy steps will go a long way to easing your spring misery. However, should you find yourself standing in a chemist in front of a selection of eyes drops, you may find yourself confused – which one works best? And even better, is there one that will not only relieve your itchy, watery eyes but also help you stay symptom-free? Pharmacologist Dr Hartley Atkinson says there are a number of factors to consider. “Something I have never understood is why there are preservatives and phosphates in eye drops – why put further irritants in eyes that are already irritated?” he says. Dr Atkinson is the CEO of pharmaceutical company AFT, who has brought Cromo-Fresh - an eye drop for allergy suffers, that not only relieves symptoms of hay fever, but also works proactively to prevent them altogether- to Australia. 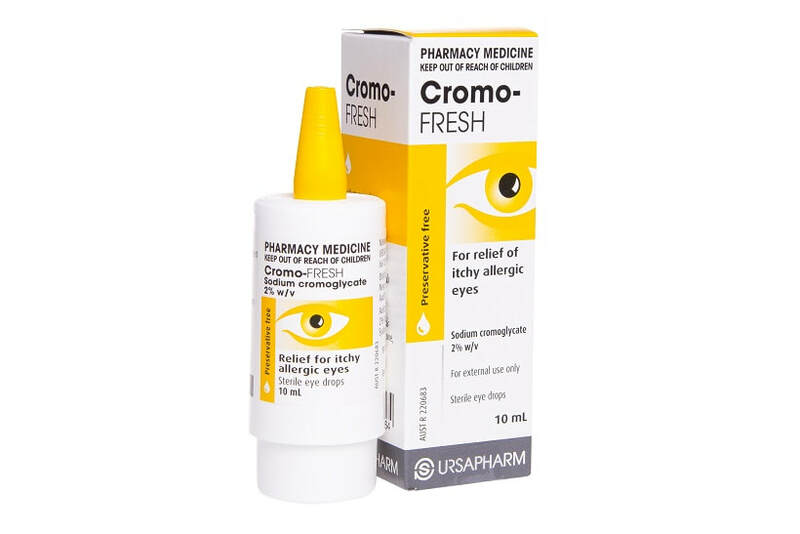 Cromo-Fresh, is the only preservative and phosphate free eye drop for allergic eyes in a multi-use bottle. Being preservative free is important as it reduces the potential for further irritation in eyes already suffering from allergies. The formulation can be used for both adults and children. “We truly believe the COMOD system is revolutionary as the device protects the solution from contaminated ambient air without the use of preservatives, allows appropriate dosage with every application, and ensures the precise delivery of at least 300 drops.” says Dr Atkinson. The best thing about Cromo-Fresh is that it can actually prevent hay fever discomfort from occurring before allergies strike – it is not an anti-histamine treatment. Because it is different to anti-histamines (which block the effects of histamines on the body), it actually stops the release of histamine and other inflammatory substances. So, the formulation works preventatively. “Regular applications of Cromo-Fresh around a week before the pollen season is due can help manage allergy symptoms,” says Dr Atkinson. “It’s easy to use on the go and doesn’t irritate the eyes further. Cromo-Fresh is available from all good pharmacies nationwide.